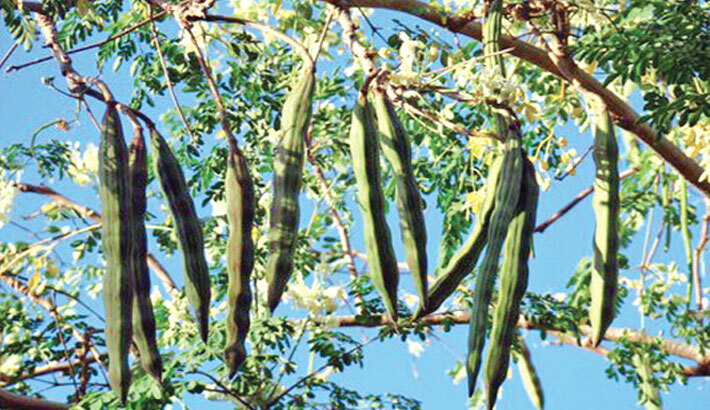 NARSINGDI: Bumper production of drumstick vegetable, locally called shajna, delights farmers of Belabo upazila, which is the biggest producer of the nutritious vegetable in the district. Favourable weather, moderate temperature made it possible to produce more drumsticks compared to the last few years. Locals said people like the taste and quality of the drumsticks and the growers are hopeful of good days as demand is increasing across the country. Nutritionist of the district said drumsticks are rich in calcium, mineral salt, iron, protein, carbohydrate and some vitamins. Locals said the tasty, nutritious drumsticks are sent from the district to many places across the country, including Dhaka and Chattogram. The price of the vegetable in the wholesale market is Tk 2,500 to Tk 2,800 per maund. Drumstick is also used as herbal medicine for treating stomach problems, high blood pressure, blood-dysentery, heart disease and other ailments, experts added. Aleya Begum, a college teacher in the district, said she bought a kilogram of drumstick from a vendor for Tk 85 on Wednesday. Kabir Hossain of the area said he had already gathered 35 maunds of drumsticks from his twelve trees so far, adding that a drumstick tree of medium size can produce around eight to nine maunds. Shop owner Kartik Mandal of Belabo area said he planted drumsticks trees around his homestead and earned around Tk 30,000 by selling 32 maunds. Subid Ali of the upazila said he got around 25 maunds of drumsticks from nine trees and made a profit of Tk 35,000, adding that many people of the area have benefited from cultivating drumsticks. Upazila Agriculture Officer said the soil of the upazila is congenial for production of drumsticks. People have started drumstick cultivation commercially, along with mango, berry, jackfruit, litchi and other fruits, he added.